Scientists studying North Atlantic right whales hope Caterpillar doesn’t end up like Lucky. Spotted off Fernandina Beach, Fla., this month, Caterpillar (above) has scars from being hit by a ship’s propeller when she was a juvenile. She is now 9 years old and could be pregnant, judging from her age and size. Lucky also had been scarred by a ship strike. But when she became pregnant, the scars broke open and became infected. Lucky and the fetus – possibly her first calf – died in 2005. With only about 100 female North Atlantic right whales capable of bearing young, every mother whale and calf is critical to the survival of this endangered species. Department of Natural Resources biologist Clay George, head of right whale work for DNR’s Nongame Conservation Section, said that Caterpillar – nicknamed for a pattern of propeller scars – is carrying even more recent scars from being entangled in commercial fishing gear. And possibly for the promise of recovering this critically endangered species. Pregnant North Atlantic right whales travel more than 1,000 miles each winter from feeding grounds off the northeastern U.S. and Canada to warmer waters off South Carolina, Georgia and northeastern Florida to give birth. These southern waters are the only known calving area for the species. Predicting how many whales will show this winter is difficult. The season's first whales on Georgia's coast were spotted this week – three breeding-age females. After a slow start last winter, 19 cow/calf pairs were documented in the Southeast, up from seven in 2012 and near the annual average of 21. In Georgia, researchers search for them by plane from Cumberland to Wassaw Island three times a week, as weather allows. On the water, Nongame Conservation Section crews photograph whales and take tissue samples for genetics research. DNR is also part of a network of state and federal wildlife organizations that help free whales entangled in fishing gear. Chronic entanglement can kill whales. More than 75 percent of right whales bear scars from previous entanglements. 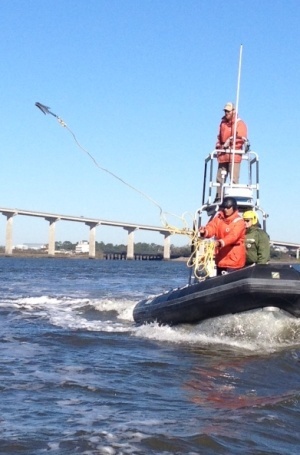 George recently led disentanglement training (right) attended by NOAA Fisheries, the Florida Fish and Wildlife Conservation Commission and DNR biologists (video). Caterpillar won’t be a target. She somehow shed the fishing gear that left cuts across her head and tail. But scientists will be watching to see if she turns up with a calf. Last year, Nongame Conservation Section staff collected a blubber sample to check progesterone levels that could have revealed if she was pregnant. She wasn’t. This winter may be different. If so, the hope is Caterpillar is truly lucky. The federal agency recently renewed speed limits of 10 knots or less for vessels at least 65 feet long in U.S. Atlantic seaboard areas frequented by North Atlantic right whales. The decision, supported by DNR, also removed the rule’s “sunset provision,” or end date. Ship strikes are a leading cause of right whale injuries and deaths. No fatal ship strikes have been documented in the speed limit zones since rule went into effect in 2008. In an 18-year study period before, 13 right whales died from ship strikes in the same areas. Boaters who spot a right whale should report it to 1-800-2-SAVE-ME (1-800-272-8363). Note: Federal regulations prohibit approaching within 500 yards (1,500 feet) of right whales. Also, NOAA has an ap for this. “See & ID Dolphins & Whales,” available on iTunes and Google Play, provides details on the biology and habitat of marine mammals, and the best ways to conserve and responsibly view them. Follow the calving season: We’ll post photos on Flickr of whales along the Georgia coast. Attend Weekend for Wildlife: Set for Jan. 31-Feb. 1 at Sea Island, this annual nongame conservation fundraiser will focus in 2014 on right whales. We seem to enjoy the sights and sounds of birds that visit our feeders and bird baths more in winter than at any other time of the year. Although we are sometimes confined to our house during this harsh season, we can still enjoy watching birds feeding, bathing and drinking from the comfort of our home. Of course, the season includes regular winter backyard residents, from chipping sparrows to tufted titmice. However, sometimes an unusual visitor will drop in. 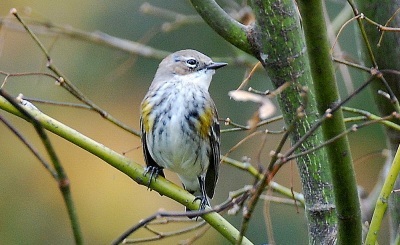 Spotting such a bird elevates the enjoyment of backyard birding to a new plateau. With that in mind, let's take a look at five of the more unusual birds, other than hummingbirds, that might visit our bird baths and feeders during this season. Find out the five in Terry’s full column! Twenty-eight bottlenose dolphins have stranded dead along the Georgia coast since November 15. 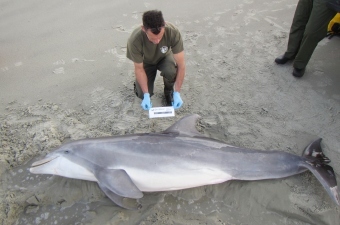 Samples submitted from four carcasses indicate they were infected with dolphin morbillivirus, confirming that the disease blamed in the deaths of some 880 dolphins stranded from New York to Florida since July 1 has reached Georgia (“Dolphin strandings spike,” Nov. 29). It’s not too late to join a Christmas Bird Count: For example, counts are coming up at Harris Neck, Okefenokee (email for details) and Savannah national wildlife refuges. Nor is too early to find results from some counts already completed in the longest-running citizen science project. About 45 people from 10 states joined a recent webinar led by Greg Krakow, Catherine Reuter and Dr. Brett Albanese about Nongame's Conservation status mapping project. The project goal: Develop a consistent method for assessing the conservation status of rare species for state wildlife action plans – Georgia’s is being revised – and species considered for listing under the Endangered Species Act. And who turns 40 this month? The Endangered Species Act, the bipartisan legislation credited with saving hundreds of species from extinction and signed into law by President Nixon on Dec. 28, 1973. Learn more from the U.S. Fish and Wildlife Service and National Oceanic and Atmospheric Administration. Need a gift sure to please the Georgia wildlife lover in your life? Try the authoritative and informative “The Natural Communities of Georgia,” “The Breeding Bird Atlas of Georgia” or “Amphibians and Reptiles of Georgia.” For easy listening, order “Calls of the Wild,” a CD of Georgia frog vocalizations. "Natural Communities" YouTube review. Eight young whooping cranes following an ultra-light aircraft on their first migration from Wisconsin to Florida have made it to central Alabama. The flight path for the endangered whoopers will cut across southwest Georgia, with stops tentatively scheduled in Clay and Decatur counties. Follow the cranes. Photos. Video. A snowy owl “invasion” has these eye-popping birds from the Arctic showing up from the Great Lakes to North Carolina and even Bermuda. None have been reported in Georgia, but one drew a crowd to Sea Island and St. Simons a year ago (“From owls to eagles,” Dec. 22, 2012). Several years of restoring native grassland habitats at Panola Mountain State Park have led to more sightings of bird species that are priorities for conserving – including rails, bitterns, northern bobwhites and several species of uncommon sparrows. As of Dec. 2, add another: A loggerhead shrike, a top conservation species in Georgia’s State Wildlife Action Plan, was spotted in grassland habitat at Panola. Join the war on invasive exotic species along Georgia’s coast. Volunteers can help remove Phragmities australis, or common reed, and make room for native plants Jan. 7-9 in the Altamaha River delta. Email DNR’s Eamonn Leonard for details. Do mussels fish? Watch as this female southern rainbow mussel lures fish with her mantle modified to look like a small fish or glob of worms. The goal isn’t to catch a fish, but to attract one close enough to attach larval mussels called glochidia to its gills, where the larvae can grow into juvenile mussels. More. Oconee Wildlife Management Area is 29 percent bigger. The DNR Wildlife Resources Division recently announced that more than 1,390 acres in three tracts have been added to the 4,800-acre WMA in Greene and Hancock counties. Rich in wildlife and natural habitats, the Red Hills Region also packs an economic wallop. A study by Tall Timbers Research Station and Land Conservancy and Florida State University found that hunting operations in the region reaching from Thomasville to Tallahassee sport a $147 million economic impact, with more than 1,400 jobs tied to those operations. Details in Tall Timbers' latest enewsletter. Snake-friendly bloggers discussed the roles snakes play in ecosystems as part of a “blog carnival” on Dec. 9, all part of Partners in Amphibian and Reptile Conservation’s Year of the Snake. Catch the recap of the blogfest. Check out the organization’s latest Year of the Snake newsletter and next year's campaign, Year of the Salamander. Exploring the Altamaha River is easier, thanks to a smartphone app created by the Altamaha River Partnership. The Altamaha River Guide, free at app stores such as iTunes, includes GPS, maps, river levels, wildlife management areas, landings, outfitters, places of interest and other details. Quick: Where does a river store its stuff? In a watershed, of course. 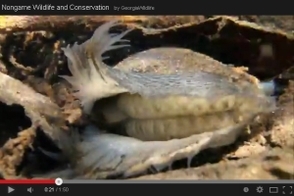 Learn about rare wildlife that lives around the lakes, rivers and streams in your area. 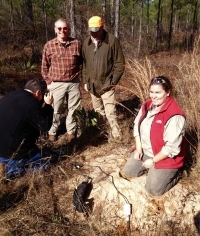 A Forestry for Wildlife Partnership tour of timberlands managed by CatchMark Timber Trust included an update on gopher tortoise conservation and training on management practices (right). Staff from CatchMark (formerly Wells Timberland), Forest Resources Consultants and DNR attended. Forestry for Wildlife is a DNR program in which corporate forest owners manage their lands in ways that help wildlife and exceed industry standards. 2014 enrollment for the Conservation Stewardship Program runs through Jan. 17. In Georgia, 978,395 acres have been enrolled since 2010 in the popular Farm Bill program that promotes conserving the environment and strengthening rural economies, according to the Natural Resources Conservation Service. Details. "Nature Conservancy names new Georgia head," Atlanta Business Chronicle. More from TNC.